A big thank you to everyone who voted for Draycott’s own John Clarke (right) in the Moorlands Volunteer Of The Year Awards. The result was announced at a special ceremony in Leek and our John came an honourable joint second. It’s all based on a public vote, so second is a very good result for someone from a small village such as ours. As John said, it’s a time of great flux for our neighbourhood, so anything that gets a positive headline for Draycott has got to be a good thing. Right now though John is hugely busy putting the finishing touches to the preparations for this year’s Draycott Fayre Weekend (on July 7th & 8th). He is chief organiser (and bottle washer!) for the fayre. 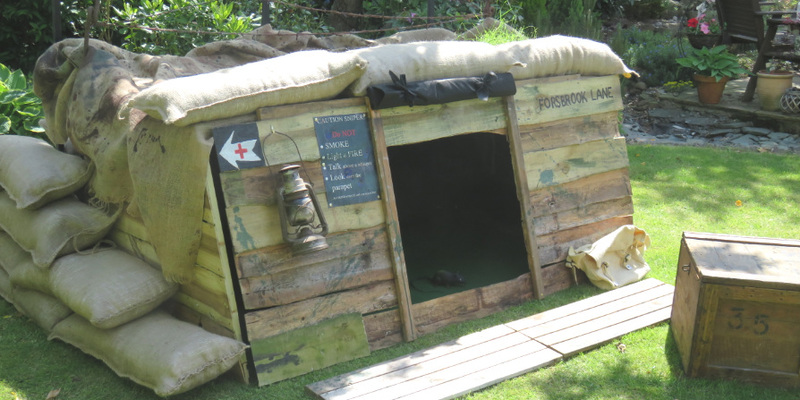 Plenty of late bookings are still being arranged, with the most fascinating one being the promise of the sight of a reconstructed World War One trench dug-out (see below)! It’s being created by the secretary of the local history society; and for anyone interested in the conflict of the 1914-18 War it will be a big draw. One thing you can do to help is put up the official poster in your window or business – just click here to access the 2018 FAYRE Poster , and then just print it off and put it where you think people will see it. Cheers!! As we reported last month, there was a brief glimmer of hope that the number 12 bus route, which runs through Draycott & Cresswell, might be restored after it was cancelled in March. However even that small hope has now been dashed, as the county council has now definitively refused to continue the subsidy for it. Some Staffordshire local/parish councils have stepped into the breach and stumped up money to keep their village bus services running, but it’s an expensive option. The other question is: how many people would use the bus even if it was brought back? The district’s local newspaper, the Cheadle & Tean Times, is now running a survey on the issue, basically asking “would you use a bus service if there was one?” If it’s something that worries you, it’s worth completing the survey, which is on page six of the current issue. While sifting among recent planning applications, we saw that Zara & Brayn at the Draycott Arms are continuing their plans for the pub by putting up proposals for a few bed-and-breakfast rooms. It certainly would be great to have such accommodation in the heart of the village, as the nearest alternatives are just out of walking distance. However, Zara & Brayn, just like John, might be a bit too busy over the next seven days to worry about that side of their business. Next weekend (Sat 7th July) they are the hosts of the Draycott Saturday Night Live In the Marquee event, when they will be putting on a mini beer & cider festival to accompany the live music on stage. Draycott hit the national headlines for all the wrong reasons last week when one local resident here in Draycott was convicted of inciting race hatred in views she expressed on her website. Barbara Fielding-Morriss, who is 79 years old, describes herself as ‘white supremacist’, a despiser of Jews and a fascistic supporter of Hitler. She faces a possible seven years in prison when she is sentenced next month. She chose not to have legal representation during the trial, which the judge was very surprised at. Fortunately, it seems Barbara is almost a lone voice and has very few members in her ‘party’. But it does all leave a very bad taste in the mouth. After all the confusion and upset over the last couple of months, a new clerk to the council is finally in place. The very popular former clerk felt compelled to resign in March saying she felt under-valued by councillors and harassed. A confusing period followed, in which one new appointee came in and then absented herself, followed by a rather flawed advertising process, and – finally – a further appointment was made. Amazingly, this rather messy performance has ended up with a good candidate. Denise Wheat is well known in Tean (the next village along from us) for being a leading light in community projects there and is an established business-woman (she runs her own photography concern). Denise is already taking courses in the responsibilities and functions expected of a clerk to a village council. Although clerks are not elected so they can’t make policy decisions, they are expected to ‘manage’ the council’s actions and procedures. Denise has a difficult job on her hands, not just with guiding the current councillors, but in responding to the government’s calls that village/community councils be more active and more transparent. What’s more, there are elections to the council in less than twelve months! This entry was posted in business, entertainment, news, transport, volunteering and tagged Draycott Arms, john clarke, st margaret's summer fayre. Bookmark the permalink. What absolute rubbish about the council. The …REMOVED AS LIBELLOUS BY EDITORS … left the council in a dire mess. This was presented at the last meeting. I understand the auditors have raised concerns of fraud – which you may want to consider instead of trying to raise hatred to those who are leading our community. ~As usual Matt, you are unclear about what exactly is worrying you. What exactly are the “rubbish” statements you refer to? ~You made some libellous statements about an individual, which we have had to remove. ~Our Mark was at the last meeting, and he heard no references to fraud. What allegations did you hear? ~As to ‘hatred’ (a bit exaggerated, don’t you think…? ), respect is given where it’s due. If you have some praise for someone local in particular, why not be positive, and write down your thoughts praising them and tell us? This website prints lots of praise too. We may laugh at her views for being loony, but sadly I disagree with your appraisal that “It seems Barbara is almost a lone voice and has very few members in her ‘party’”. Journalists such as the brilliant Melanie Phillips and organizations such as United With Israel are recording rising amounts of attacks on Jewish people in our country. The Orthodox Jew Cheradi communities are being hounded by the authorities, and its Rabbis are considering leaving the UK, while other ‘religious extremists’ get a free pass. We think we are Progressive in the UK and beyond what Hitler did in the 1940’s but Anti-Semitism is alive across the middle-east and it is only set to get worse in Britain, as even the Labour Party is struggling to keep it under control in its own party. Grendel, we did not mean to downplay the seriousness of anti-semitism in this country; it was just an assessment of Ms Fielding’s party. You are right of course about the wider seriousness of the problem.